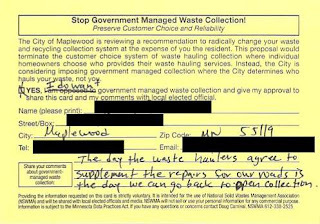 We're hearing from residents on both sides of the organized hauling debate. 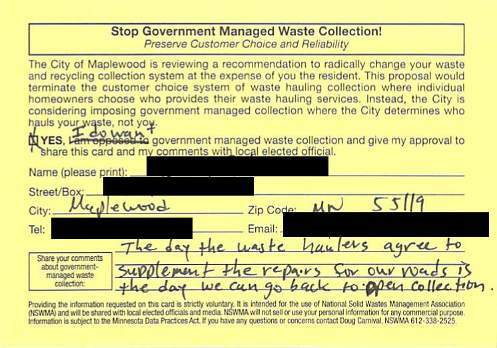 This morning one Maplewood resident sent me a scan of the NWSMA postcard that he is mailing to the city. A big part of me hates when big private & quasi/semi-private entities meddle in my local politics. Especially when it involves something as simple as garbage collection. I especially hate when they spam us will big scary propaganda letters filled with innuendo and half-truths. I am guessing this will be an interesting and passionate fight for many. At one point, I too would never have wanted there to even be a discussion about the subject. Now that I am a little older and a little wiser, I see the big picture. That being the damage the 3+ trucks per day inflict on our streets. Not to mention the landfilling done by certain haulers in the pursuit of profit. As I wrote in the post card…The day the haulers (and especially NSWMA) decide to supplement the maintenance of our roads and agree to haul all of the waste to the Newport facility is the day we can go back to open collection.